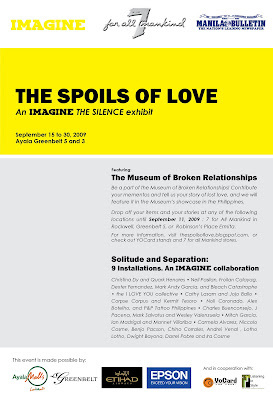 The Spoils of Love: An Imagine The Silence exhibit features The Museum of Broken Relationships and Solitude and Separation - 9 art collaborations by Filipino artists, designers, and creative professionals. The exhibit runs September 15 to 30, 2009 at the Ayala Malls Greenbelt 5 and 3. This event coincides with the release of the two-time IFRA award-winning fashion, art, design and ideas magazine, Imagine. Be a part of the Museum! Anonymously donate items from your old relationships and tell us your story of heartbreak and love lost. Submit your item and your story to 7 For All Mankind stores (Rockwell, Greenbelt 5, and Robinsons Midtown) until September 11, 2009. For more information on The Museum of Broken Relationships and The Spoils of Love, log on to thespoilsoflove.blogspot.com or check out 7 For All Mankind stores and selected YOCard stands. This event is made possible by Ayala Malls Greenbelt and Etihad Airways, with the full technical support of Epson Philippines, and in cooperation with YOCard and the Listening in Style Group of Companies.